Boston loses to Florida 3-2 and remains tied with Tampa Bay atop the Atlantic Division. 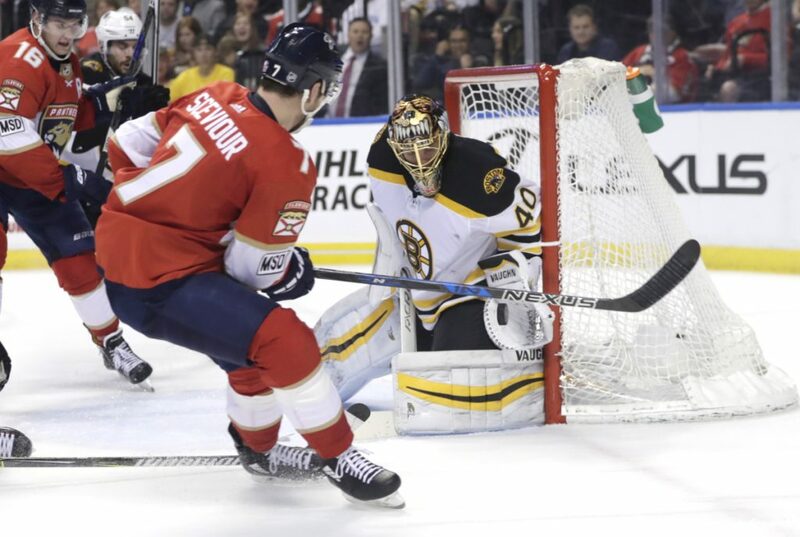 SUNRISE, Fla.— Jared McCann scored with 5:37 left and Roberto Luongo got the win in his 1,000th career game, helping the Florida Panthers stay in contention for the playoffs with a 3-2 victory over the Boston Bruins on Thursday night. The Panthers trail the Philadelphia Flyers by four points for the final Eastern Conference wild card and have two games remaining, including a matchup Sunday night with Boston. Florida needs to win both games and have the Flyers lose to the New York Rangers in regulation Saturday. The Bruins remained tied with Tampa Bay atop the Atlantic Division with 110 points with two games left. The Bruins are home against Ottawa on Saturday and Florida on Sunday; Tampa Bay is home to Buffalo Friday night and at Carolina on Saturday night. Tampa Bay owns the tiebreaker. The 39-year-old Luongo became the third goalie to reach the 1,000-game mark, joining Hall of Famers Martin Brodeur (1,266) and Patrick Roy (1,029). Luongo is the 322nd player to reach the milestone overall. He stopped 26 shots Thursday. Aleksander Barkov scored his 100th career goal, and Frank Vatrano scored a goal against his former team for the Panthers. Danton Heinen and Ryan Donato scored for the Bruins. Tuukka Rask stopped 32 shots. McCann tipped in the winner off Mike Matheson’s shot from the left side. The Bruins tied it at 2 on Heinen’s goal 2:11 into the second period. After a defensive turnover, David Krejci passed across to Heinen, who beat Luongo on the stick side. Trailing 2-0, the Bruins closed to 2-1 on a power-play goal by Donato, who corralled a bouncing puck in front and swept it behind Luongo with 4:41 left in the first. The Panthers took a 1-0 lead on Barkov’s goal. Evgenii Dadonov made a nice pass from the right side to Barkov, who tucked the puck into the corner of the net at 7:42. The Panthers went ahead 2-0 after Vatrano, acquired by the Panthers in a trade with Boston on Feb. 22, poked in a rebound at 9:34.